We know that people switch off when faced with "traditional" (boring and stuffy) training. That’s why we work hard to make our training so engaging (fun even!). This way your staff remember what they’ve been taught. Our trainers put people at ease and create an environment where even the most painfully shy feel able to participate and engage. This is why 100% of our attendees rate our courses as very good or excellent. We only use experienced health care professionals, typically paramedics and nurses - not people who have learned it from a book. Our expert team always train the latest first aid techniques. Training courses are offered at all levels, from the most basic techniques to advanced first aid to meet specific risks in the workplace i.e. working at height or working with dangerous chemicals etc. We can also tailor courses to meet any specific first aid needs, providing training at our own facilities in Milton Keynes or on-site training at our clients’ premises and refresh all First Aiders holding a full First Aid at Work certificate, regardless of where they were first trained. 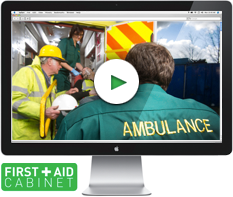 We also run a great new online learning resource, First Aid Cabinet - where you can learn everything you need about First Aid for Children, all in one place! The UK’s leading, most comprehensive, online resource including over 30 videos. Learn what to do in any given emergency situation involving babies and young children. Our team of highly qualified staff have been working together for many years and have over 50 years of experience in providing accredited first aid training to a wide audience. We are extremely flexible in our approach and all of our courses fully reflect current best practice in first aid. Director of the company. Barbara has a passion for teaching first aid ever since her life was saved following a serious accident. She has been teaching First Aid courses since 2002 after obtaining her Certificate in Education and has been running Guardian First Aid since 2006. Sonia is a qualified nurse and her background is in Major Trauma. She is a very experienced trainer and has a particular focus on training for medical professionals in GP practices and Dental Surgeries. She's qualified to deliver the full range of First Aid training and manual handling of both people and objects. Melanie's background is in Paediatric nursing.She specialises in providing training for carers, foster parents, school children and pupils and can deliver the full range of First Aid courses. You will also find her providing first aid cover at local events.